GET CASH FOR YOUR TEXTBOOKS! Turn your new or used college textbooks into CASH! Bring in your textbooks, study guides and workbooks. We will search our national database to get you top dollar for your books. We buy 6 days a week, 52 weeks a year. Never worry about missing your university bookstore’s “buyback window” again. Don’t wait for payment from an online retailer, or pay for shipping. 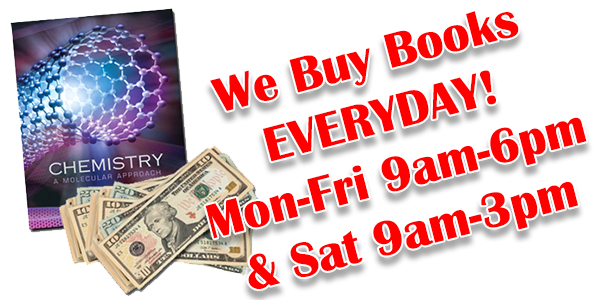 Box King pays you cash immediately when we purchase your textbooks. Textbooks must be free of stains, water damage, tears or missing pages. Any supplements, such as access codes or cds/dvds must be included. Minimal highlighting and writing is acceptable. Textbooks must currently be being used in colleges or universities. We cannot accept foreign language editions, instructors editions, loose leaf textbooks, or school specific editions. We purchase 6 days a week, any time we are open. We pay top dollar cash on the spot. No waiting 3-4 weeks for money to be sent from an online company, or only being able to sell during your school’s short buyback window. We cannot give quotes over the phone or online, but look forward to assisting you in our store.